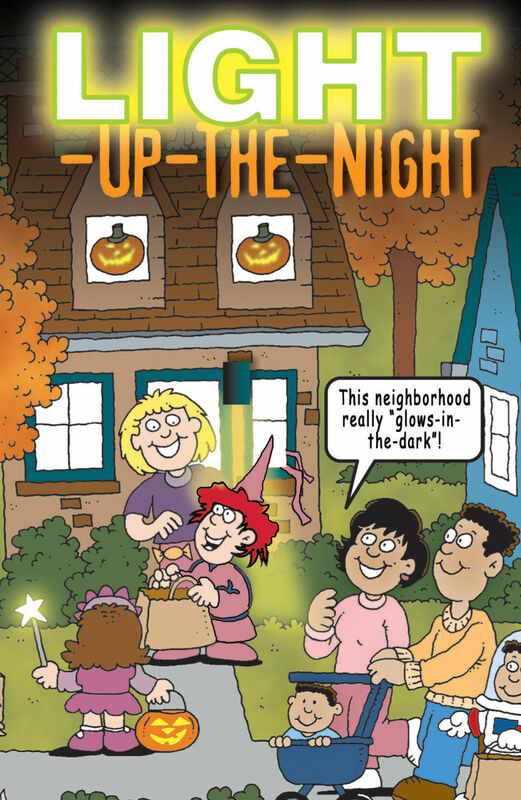 This tract for kids teaches them that they should be a light to those around them! Without a light inside it, a jack-o-lantern is really just a plain pumpkin. You don’t really notice it, and it looks kind of boring. But add a candle or light bulb, and WOW! It really stands out. Even way down the street you can see the friendly, glowing face or design, and you know it means something good. Someone is home on Halloween night, and you are welcome. That is how light works. It stands out in the darkness. Depending on its brightness, light can make the darkness around it disappear altogether. Light is so important that it was one of the very first things ever created when God made this world. The following Bible verses will explain. Not only was there light, but the light was GOOD. Sometimes the bad things that happen to us in this world are called “the darkness.” God sent someone into this world to bring light and take the darkness away, and that someone was God’s very own Son, Jesus Christ. It’s nice to be near a light when there’s darkness all around you. That’s why God invites us to believe in Jesus and walk next to Him and His light all our lives. Sin is darkness too, and it is inside all of us. Sin is anything we do that is not approved of by God. Lying, cheating, and being selfish just the least little bit are all sin, and sins deserves to be punished. But because God loves us so much He gave us Jesus to take away our dark sins with His light. When Jesus died on a cross, He was taking our punishment in our place. Then He rose again to give us new life. When we trust in Jesus, God forgives our sin and makes us His children of light forever. You can tell God in a prayer that you believe in Jesus and you want His light inside you. Dear God, I know I am not perfect and I do things that displease You. Please forgive me. I believe that Your Son, Jesus, died to pay the price for my sin. I believe He rose again to bring new life and light to the world. Help me to shine His light to everyone I meet. Amen.